The following is a guest post by Jim Morgan. Jim is a personal financial adviser and a catechist in the Diocese of Charlotte, North Carolina. A convert to Catholicism, he is an expert in contemplative prayer and a proponent of frequent confession, daily Mass and daily spiritual reading. The following post is presented with his permission. In the Tridentine Mass the priest offers Mass facing the same direction as the people because he and the people together are offering worship and sacrifice to God. He is not turning his back on the people to exclude them. Rather, as a Christian community, all are facing ad orientem (i.e. toward the east) waiting in joyful expectation for the coming of our Lord Jesus Christ who will return to judge the living and the dead and the world by fire (Rite of Baptism, 1962). Significantly, this posture was actually ordained by God even before the Incarnation and Redemption, as prefigured in Sacred Scripture. God taught Moses how he wished to be worshiped and it is manifested in The Book of Exodus. As priest, Moses goes to the Tabernacle to stand before God, interceding for the people who are required to watch while standing in front of their tents. In addition they were required to bow low when God came down from the Cloud (just like in the Canon of the Mass when our Lord comes down on the altar). “Whenever Moses went out to the Tent, the people would all stand up and every man would stand at the door of his tent and watch Moses until he went into the Tent. And whenever Moses went into the Tent, the pillar of cloud would come down and station itself at the entrance to the Tent, while Yahweh spoke with Moses. The people could all see the pillar of cloud stationed at the entrance to the Tent and the people would all stand up and bow low, each at the door of his tent.”(Ex 33:8-10). In a beautiful transition, this is then manifested in the New Testament. God reiterates at the Transfiguration that he wishes to be worshiped in the same way. Peter says he wants to build a separate tent [Tabernacle] for our Lord just as Moses had built for God in the desert. Then we are told “Peter didn’t know what he said”. This is because the Holy Spirit made him say it to prepare the three disciples for what would come next. Soon three of our first priests (like Moses) are engulfed in a cloud, alone and facing our Lord, in other words facing God (Moses and Elijah are gone). And then to make sure these three understand that God wants the Second Person of the Trinity to be worshiped as God was in the desert by Moses, God the Father speaks from the cloud and says, “This is My Son, do as He says”. This is why Dom Prosper Guéranger, one of the greatest liturgists in the history of the Church, says that when the long prayer of the Canon begins, “the Priest then enters within the cloud. His voice will not be heard again, until The Great Prayer is concluded.” (The Holy Mass, pg. 96). “Now about eight days after this had been said, he took with him Peter, John and James and went up the mountain to pray. And it happened that, as he was praying, the aspect of his face was changed and his clothing became sparkling white. And suddenly there were two men talking to him; they were Moses and Elijah appearing in glory, and they were speaking of his passing which he was to accomplish in Jerusalem. Peter and his companions were heavy with sleep, but they woke up and saw his glory and the two men standing with him. As these were leaving him, Peter said to Jesus, ‘Master, it is wonderful for us to be here; so let us make three tents, one for you, one for Moses and one for Elijah.’ He did not know what he was saying [the Holy Spirit made him say it so they would understand what came next]. As he was saying this, a cloud came and covered them with shadow; and when they went into the cloud the disciples were afraid. And a voice came from the cloud saying, ‘This is my Son, the Chosen One. Listen to him.’ And after the voice had spoken, Jesus was found alone. The disciples kept silence and, at that time, told no one what they had seen.”(Lk 9:28-36). At the Transfiguration God clearly reaffirms, indeed He re-ordains, how He wishes to be worshiped. Thus, the Mass ad orientem, facing the Lord together, is not only scriptural but supernatural because it is a creation of God Himself. Posted on March 14, 2014, in liturgy and tagged ad orientem, cardinal ratzinger, dom prosper gueranger, exodus 33, facing the east, liturgical east, moses, tabernacle, transfiguration. Bookmark the permalink. 2 Comments. 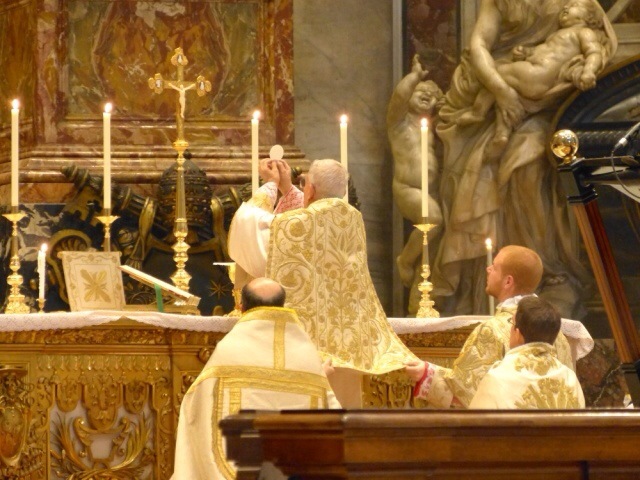 I found your blog on traditional Latin mass Catholics -catholic Tridentine mass. I am happy I did because I am always ready to learn more about our faith. When I was a young girl and made my first communion the traditional way it was a sacred and beautiful for me but now since Vatican II the new mass makes it as just a symbol by allowing people to recieve the host in the hand. When the Catholic Church started changing in the 60’s I was very disturbed by it and I was still a young child then. Now I know why I was bothered by it. God bless you and keep up the good work and thank you for helping me in learning more about our true faith. Thank you for your kind words Henrietta! I have a couple older blog posts on receiving Communion that might interest you: “A Sign of Adoration” and “On Receiving Holy Communion”. God bless and I look forward to more of your comments in the future!